Discover exuberance that springs to life by residing at Artech Luxus, Sasthamangalam, Trivandrum . An unrivalled slew of facilities and 4 layout options of spacious & contemporary 3BHK apartments to choose from. The apartments at Artech Luxus is designed for modern living and to meet the demands of today’s astute buyers. The minimum units- per -floor ratio offers ease of access and greater privacy for each of the apartment unit. Artech Luxus with its 3 floors dedicated to leisure amenities promises a world of features like swimming pool, modern gym, landscaped gardens, banquet hall, indoor games, AV room etc. Staircases using granite /vitrified tile flooring with hand railing using matt finished SS / MS with or without toughened glass as per architect’s design. Foyer / Living / Dining using 80cm X 80cm Premium Double charged vitrified tiles (Kajaria /Asian). Kitchen: 60cm X 60cm premium double charged Vitrified tilesforthe flooring (Kajaria /Asian). Master Bed Room: Laminated wooden flooring AC4 Grade. All other bed rooms 60cm X 60cm Premium Double Charged Vitrified tiles. All Bed room Toilets : Designer ceramic tile concepts 30cm X 30cm for floor and 60cm X 30cm for walls up to ceiling height of 8′ 0. Servants Toilet : Ceramic tile 30cm X 30cm for floor and 30cm X 45cm for walls upto 8’0″ height. Utility Room : 30cm X 30cm for floor and 30cm X 45cm for (kitchen wall) walls upto 4’6″ height and 2′ above the counter if any (using any premium Indian brands). Balconies / Open Terraces / Decks : Rustic / Antiskid / ceramic tiles 30cm X 30cm or (wood finished vitrified tiles) with MS / SS / Toughened Glass railings upto 1.2M heights (using any premium Indian brands). Faucets: for all the bed room toilets will be single lever concealed diverters CP finish, heavy body metal fittings of ROCA from Spain or GROHE from Germany or equivalent make. Provision for hot water connection shall be provided for overhead shower (30cm X 30cm over head rain shower for master bed toilet and multi function over head shower in other toilets, normal showerfor servanttoilet). Wall mounted single lever faucet make ROCA from Spain or GROHE from Germany will be provided for the wash basins, Kitchen and utility area sink. Plumbing: All water supply lines shall be in ISI marked CPVC pipes. Drainage lines and storm water drain pipes shall be in PVC, Cockroach traps make CHILLI shall be provided as gratings for all necessary locations, Health Faucet ROCA from Spain or GROHE from Germany shall be provided near EWC in all the toilets. Stainless Steel Sink multi bowl with drain board of make NIRALI / FRANKE shall be provided for the kitchen and stainless steel sink without drain board shall be provided forthe utility areas. Window shutters: Prefabricated colour anodised aluminum sliding shutters by (Hindacor or equivalent). One pane of Insect screen also shall be provided in each window. Door Frames: Main door frame and shutter shall be of seasoned teak wood. Outer and Inner face to be PU coated and finished as perthe Architect’s design. Door Shutters: All internal door frames shall be of seasoned hard wood with flush door shutters. All internal and external faces shall be melamine finish or Paint finish as perthe Architects design. Entrance door shall have hardware such as, Magic Eye, Safety Chain, Door Stopper and a BIO Metric lock from SAMSUNG or equivalent. Wiring shall be done for lighting, 5Amps, 15 Amps and AC points in the Apartment. Switches: All switches shall be LEGRAND – ARTEOR make or equivalent. Generator: Power backup will be provided for all common services and selected light and fan point in each living, bedrooms inside apartment and a refrigerator point, plus additional one 5Amp plug point in the Kitchen, one light point in all the toilets, one 5Amp plug point at Living for emergency charging of devices shall be provided (Air-conditioning and Geyser points and other 15Amp points will not be considered for the power back up). All lightfixtures shall be of PHILIPS/ HAVELLS. Elevators: High Speed lift shall be provided as per the Govt. norms in each core with automatic doors & SS brush finish of KONE/ SCHINDLER or reputed make. Light motion sensorsfor selected common areas. Home security monitoring, gas leakage detectors,emergency panic intrusion alarm, visitortracking. Tiling Work -85 % to be completed. RCC for structure – water tank work – 100%to be completed. RCC for structure – water tank work – 92%completed. Tiling Work – 1st floor (50% completed); 2nd floor to 7 th floor(70% completed). Earthwork Excavations – 100% to be completed. Earthwork & Backfilling work – 100% to be completed. Block/Brick masonry – 17th & 18th floor – 100% to be completed. Door frame fixing – 17th floor – 100% to be completed. Wall plastering work – 12th & 13th floor – 100% to be completed. Putty work – 5th floor – 100% to be completed. Work status as on 1 3 -0 3 -2018, we have completed the following. 27 nos of Piling works out of 101 and expected to complete 20 nos more out 101 by next month. Sasthamangalam is a peaceful residential area where the homes of upper middle class people can be found. In recent years, this locality in Trivandrum has been seeing rapid urbanization with more and more apartments in Sasthamangalam cropping up. Esteemed builders like Artech Realtors have prestigious projects in all prime locations in this capital city and you can be sure to find Artech apartments in Sasthamagalam too. This locality is an important place as its home to a junction where four important roads converge. These include roads from Vattiyarkavu, Vellayambalam, Peroorkada and Edapazhinji. This strategic location makes all parts of the city easily accessible in a jiffy. The Trivandrum Central Railway Station and Central Bus Station are just 6km from Sasthamangalam and don’t take too much time to reach either. You will also find the Sasthamangalam Mahadevar temple here, one of the four temples visited regularly by the former Kings of Travancore over the past centuries. 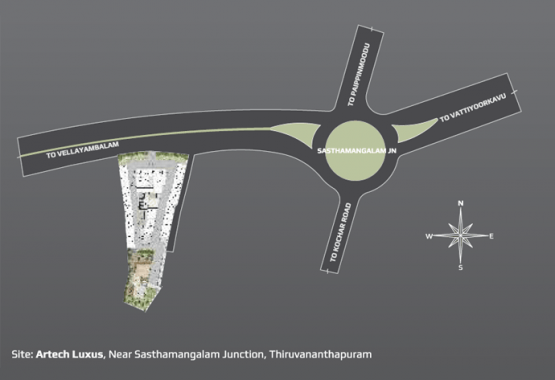 Interestingly, the area where the kings’ chariots used to be parked is now named Rathapurakkunnu Road. The scenic Killi River can also be seen meandering its way through Sasthamangalam. With so much history and natural beauty attached to this area, more and more people are taking interest in buying flats in Sasthamangalam. With the city central areas becoming increasingly congested, people now prefer to settle in the Sasthamangalam area where there are still open spaces available with lower pollution levels. It’s no wonder then that flats in Sasthamangalam are gaining popularity.